Welcome to the 21st Century classroom! Los Coyotes students using technology to enhance their learning. We are very excited to have Smart Boards, iPads, and technology tools in our classrooms. Interactive white boards. 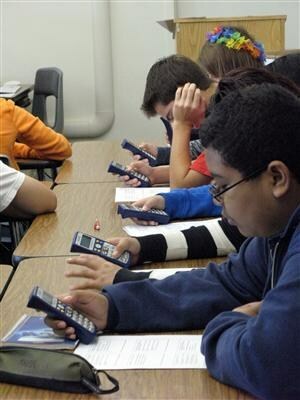 iPads, and other devices allow students to connect to multiple forms media directly in their classroom. Students are able to physically touch the board and devices to add their ideas for the entire class to view. They also allow teachers to create interactive lessons to provide a more enriched curriculum. 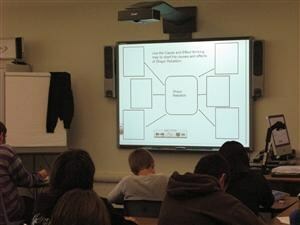 This picture depicts a Smart Board which is displaying Thinking Maps, a graphic organizer to help students better organize their thinking and ideas. With this technology, students are able to connect to the internet directly from the classroom, providing them with a plethra of resources available online. Students are also able to create podcasts to broadcast for everyone to learn from. These technology opportunities are used in the classrooms to help teachers instantly assess students learning during formal assessment, as well as for informal assessment to allow teachers to quickly determine if adjustments are necessary in the lesson. Our vision and hope is to one day have technology in all classrooms. We believe that technology is an important part of education and we are dedicated to work hard to get this technology into the hands of our students. We understand how important it is in this day and age for students to have access to the vast amount of information available. We are committed to a focus on using technology in the classroom as much as possible. For more information about Los Coyote's Technology Plan, click on the link below.